He is trampling out the vintage where the grapes of wrath are stored"
—Julia Ward Howe, "The Battle Hymn of the Republic"
1939 novel by John Steinbeck, made later into a film directed by John Ford and starring Henry Fonda. The film is considered one of Henry Fonda's finest performances, and the book makes a strong political statement (of the social liberal kind) and is pretty much the antithesis of anything by Ayn Rand. 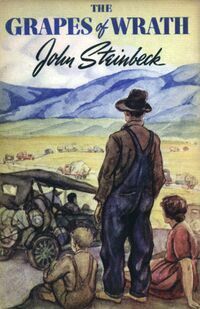 The story follows a poor family from Oklahoma hit by the dust bowl that travel all the way to California (losing the grandparents along the way) to find jobs on the orange farms. Sadly, they discover that the work conditions are horrid and farms are overpopulated. The Alleged Car: The Joads' car, and pretty much every one that the Okies use to go to California. Animal Motifs: The book version has in its third chapter a tortoise trying to cross a road and getting run over by a truck. In the fourth chapter, we meet Jim Casy, who's described as having a "long head" and a "beaked" nose. Also, Connie is described as resembling a coyote. As the Good Book Says...: Steinbeck uses Bible quotes when they agree with what he's trying to say, but states that Christianity, as Casy used to practice it, has a lot wrong with it. Author Tract: and plenty of Author Filibusters, too. A few do fit into why the Joads are going through such trouble, but most of them pop right out of left field. Bad Cop, Incompetent Cop: Well, definitely the former half of it. The book attempts a justification: in California at this time, they were paid per arrest, with no deduction for arresting the wrong person. Empathic Environment: At the end, it begins to rain heavily when the cotton crop is picked through and the pickers are out of work. The Film of the Book: A very successful one, amply considered a classic. Funetik Aksent: To the point where Rose of Sharon's name is rendered as "Rosasharn" in dialogue. Gas Mask Mooks: the tractor drivers in the movie, looking distinctly inhuman. The one who talks to Muley Graves just wears goggles, however. Good Samaritan: Casy is the most prominent, but there are quite a lot of them, particularly in the original book. Arguably, they're half the point of the story. Actually they leave the camp and move on after Tom takes leave. The film has a more ambiguous hopeful ending, leaving their fates up to interpretation. Hatedom: Jaw-droppingly vehement. They even had book-burnings for a while. Honest John's Dealership: A chapter describes a car dealership that sells old, crappy cars at outrageous prices to the migrating farmers. Just Following Orders: The tractor driver who talks to Muley Graves notes that Graves' anger to him for betraying his people is all very well, but he has a family to feed as well; if he quits in outrage, all that'll happen is the banks will hire someone else to do his job, and he and his family will merely end up starving along with everyone else. Last Second Chance: Casy attempts this on a strikebreaker, who promptly bashes his head in. It Got Worse: Averted in the movie, but brutally, cruelly present in the book. Iron Lady: Ma Joad She exemplifies all the traits but, most importantly, manages to hold the family together through sheer force of will alone. Mellower than most examples, see below trope. My Greatest Failure: In the book, John's wife died after what he thought was a stomachache turned out to be much more serious. His every action is driven by atonement, and his self-hatred is such that even other characters consider it Wangst. The Promised Land: California. Subverted in the fact that Everyone else had the same idea of going there, and the Okies are blocked from getting anything decent out of it, forcing them to settle with labor camps. Punch Clock Villain: virtually every baddie. Discussed in a tragicomic scene where a fellow forced off his farm tries to figure out who he should shoot in revenge. Secretly Wealthy: Two unnamed characters discuss this trope. The conversation mostly serves to highlight how ridiculous the trope sounded during the Great Depression, when a substantial part of the population had trouble affording food. Shoo Out the Clowns: As the Great Depression starts hitting the Joads, it's Tom's bumbling, senile grandparents who are the first to die. 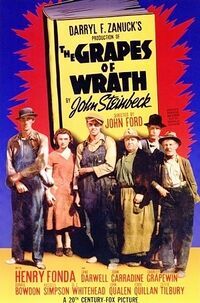 Title Drop: Comes at the end of the 25th chapter: "In the souls of the people the grapes of wrath are filling and growing heavy, growing heavy for the vintage." Could almost be the Trope Namer. What Happened to the Mouse? : the turtle that is given an entire chapter in the beginning but never serves any purpose thereafter. except, you know, to symbolize the plight of the migrant workers and the tenacity of the human spirit. Also, Noah Joad in the movie. In the book he decides he cares more about the river the family stops by than the family cares for him and leaves, in the movie the scene is still present but the aforementioned part is not, and Noah simply vanishes. What Is Evil? : Casy provides a rare heroic example. He believes in helping others, but he's no longer so certain that there's anything wrong with, say, free love.